This responsive entertainment Magento theme is designed to promote any party-related items. Its palette is presented with a violet color and its shades, but some elements, e.g. search, login and add-to-cart buttons, also turn raspberry pink on hover. Along with such a vibrant color scheme, patterned backgrounds convey the festive atmosphere of parties as well. In terms of functionality, the theme features a drop-down option enabling visitors to log in to your e-store with Google and Facebook. Thanks to tabs, they can also get an access to multiple products at once, without leaving the front page. As a bonus, there is a pop-up newsletter form whose design is line with the rest of the theme. Mobile gadgets drive 80percent of worldwide web usage. It's fundamental to establish your web property responsive if you do not desire to lose your current viewers. On-line chat lets you speak with the valued clients real-time. It enables you to live chat with guests and analyze guests' web functions. Bootstrap is very variable for any changes. It is easy to manage with, has a great grid system and substantial elements variety. It is a attribute that can help to meet all user and search engine expectations and achieve ranking positions in the search. This is a unique process when the background picture shifts less quickly in perspective in comparison to the parts of the foreground. Due to this, Parallax leads to a feeling of a three-dimensional space. Parallax scrolling offers your viewers an illusion of depth in 2D spaces of your website. It makes your resource more vibrant and distinctive. Parallax is great for spicing up a single-page site, livening up infographics, or perhaps presenting a portfolio. Can I put a line at the bottom (or any other spot) of my new product "Website development by Company name" after purchasing Gifts Magento design theme? Yes, you can place a note at the bottom (or any other spot) of my product "Website development by Company name". Nevertheless, you cannot place "Website design by Company name" while using one of Gifts Magento design theme. Is it possible that Template Monster will contact my client which website I made from Template Monster's website Magento template for Events Company? Yes, our legal department checks licenses regularly. In case we won't find designer's contact information on the site which was made from the Magento template for Events Company of ours we will contact the owner of the site directly. What is a unique purchase license for Magento theme for Conference Event Planner? If you purchase the product at a 'Unique price' it guarantees that you are the first and the last person to buy this Magento theme for Conference Event Planner from us. It means that this template has not been sold before and you become an owner of a unique design. After this kind of purchase the template is being permanently removed from our sales directory and is never available to other customers again. The unique purchase license allows you to develop the unlimited number of projects based on this template, but the template should be customized differently for every project. Can I resell Magento themes for Games & Nightlife News I bought the developers license for? You cannot resell the customized Magento ecommerce template for Halloween Accessories Store as a template, but you may sell it as a project to your client. What is a one time usage license for a Magento ecommerce template for Event Planning Company? When you buy the Magento ecommerce template for Event Planning Company at usual price you automatically get the one time usage license. It enables you to use each individual product on a single website only, belonging to either you or your client. You have to purchase the same template again if you plan to use the same design in connection with another or other projects. When passing files to your client please delete the template files from your computer. Can I resell the Magento ecommerce theme for Kids Halloween Shop as is? No, you cannot resell the Magento ecommerce theme for Kids Halloween Shop as is. Can I customize the Magento ecommerce template for Masquerade Costumes Shop? Yes, you can customize the Magento ecommerce template for Masquerade Costumes Shop to any extent needed. You cannot use a header of the template for one project though, and images from the template for the other project. How many applications, programs etc can I use to integrate with the Magento designs for Entertainment under one extended license? The extended license gives you the right to use the purchased Magento designs for Entertainment for the integration with one software/freeware/application/CMS/sitebuilder only. In case you would like to use the template with the other application, the other license is to be acquired. Will you help me to customize my Magento theme for Halloween Decorations Shop? We do not provide any help or instructions on Magento theme for Halloween Decorations Shop customization except for www.template-help.com help center. If you are not sure you can customize the template yourself we recommend to hire a design studio to customize the template for you. Can I put a line at the bottom ( or any other spot) of the customized Event Planning Magento design theme "Website design by Company name"? No, you cannot place a line at the bottom ( or any other spot) of the customized Event Planning Magento design theme saying "Website design by Company name". Nevertheless, you can place "Customized by Company name". 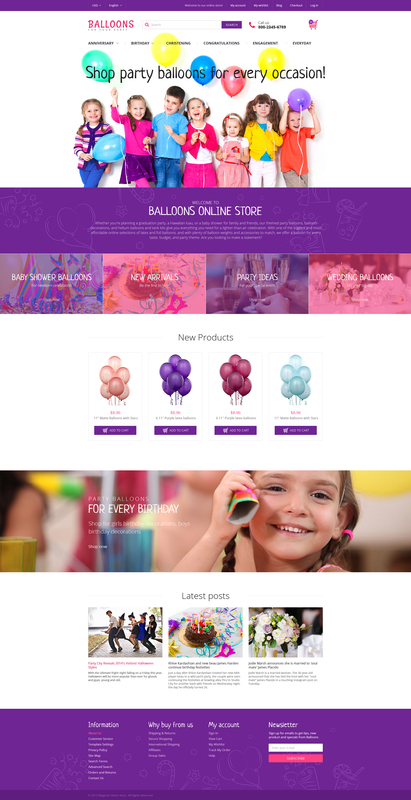 What is the price for acquiring the extended license for Magento ecommerce theme for Birthday Party Planner? There is no set price for acquiring the extended license. The price is based on the Magento ecommerce theme for Birthday Party Planner's unique price for those templates you would like to use for the integration. The price for purchasing license for a single template is half of the template unique price. Is it possible to reactivate my download link for Holidays Magento design if it was deactivated after 3 days? Yes. Please re-activate the download link for Holidays Magento design within your account under the Downloads tab or contact our billing department directly regarding that. Can I put low resolution thumbnails of Magento ecommerce templates for Event Planning Organization on my website for my clients to choose designs? I ordered a Wedding Planner Magento design theme but haven't received the download information. In case of not receiving the download information of a Wedding Planner Magento design theme, please contact our Billing Department via support chat by phone or e-mail. I have customized the Event Management Magento ecommerce theme and would like to protect my content by copyright, can I place Copyright, Mycompanyname.com? After Event Management Magento ecommerce theme purchase you can put your copyright to the template. But you cannot place a line at the bottom (or any other spot) of the customized project saying "Website design by Company name". Nevertheless, you can place "Customized by Company name". Are there any restrictions for using imagery, cliparts and fonts from the Halloween Decorations Shop Magento theme I purchased? All imagery, clipart and fonts used in Halloween Decorations Shop Magento theme are royalty-free, if not stated otherwise on the product page, and are the integral part of our products. One Time Usage License and Developers License give you the right to use images, clipart and fonts only as a part of the website you build using your template. You can use imagery, clipart and fonts to develop one project only. Any kind of separate usage or distribution is strictly prohibited. Will the Holidays Magento design be deleted from TemplateMonster database? No, the Holidays Magento design will not be deleted from TemplateMonster database. Can I integrate the Magento ecommerce template for Holidays with third-party software or applications for development of my new products? No, you cannot get the developers license for development of Magento ecommerce template for Holidays or other products. Can I get the Magento design theme for Holiday Decorations Shop in higher resolution to use for printing? No, we design Magento design themes for Holidays optimized for web resolution only. I would like to make payment for Magento theme for Halloween Shop by company check. Is that possible? Please use Skrill payment option. They accept payments by check.You can place an order for Magento theme for Halloween Shop on the site under the name of the company and choose Skrill merchant system for making payment from the company's account. To initiate bank transfer, please create an account here - www.skrill.com, add the number of your bank account and verify it. After that, you can place an order on our website and choose Skrill on checkout page. When the payment is made, the product will be sent to your e-mail along with the invoice under the name of your company. What am I allowed and not allowed to do with the Holidays Magento design themes? You may: Build a website using the Holidays Magento design in any way you like.You may not:Resell or redistribute templates (like we do).Claim intellectual or exclusive ownership to any of our products, modified or unmodified. All products are property of content providing companies and individuals.Make more than one project using the same template (you have to purchase the same template once more in order to make another project with the same design). Can I resell the Event Management Magento ecommerce themes I bought the extended license for? No, you cannot resell the Event Management Magento ecommerce themes as is. You can only sell them as the integral part of your new product. Funciona perfectamente, quedo a la primera instalaci&oacute;n, f&aacute;cil de personalizar. La documentaci&oacute;n que incluye te gu&iacute;a paso a paso. 100% Recomendable. I made a magnificent website without spending much time with the help of the template. Exactly what it appears to be.